Betty Willis’ parents were true Las Vegas pioneers, arriving in the city in 1905, the year it was founded. Willis was born in 1924, the youngest of eight children. At a young age, she showed a talent for art and design, so as a young adult she went to Los Angeles to enroll in art school in 1942. When she returned to her hometown a few years later, she found work creating advertisements for local casinos. In the 1950s she made the transition to designing neon signs, working for Western Neon. Almost all sign designers at the time were men, but Betty quickly made a name for herself in that male-dominated world by creating beautiful, memorable designs. 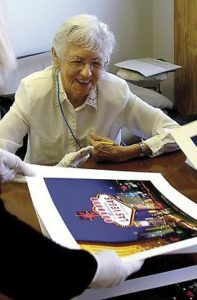 She designed the swooping Moulin Rouge sign and the iconic Blue Angel sign at the Blue Angel Motel, but by far her most famous design is the “Welcome to Fabulous Las Vegas” sign that still stands at the south end of the Las Vegas Strip. Willis designed the sign at the suggestion of local salesman and city booster Ted Rogich, and when the sign was complete in 1959 Rogich and Willis sold it to Clark County for just $4000. Willis never copyrighted her design, calling it her gift to her hometown. Later she took a job at another sign company, Ad Art, where she continued her design work until she retired at age 77.